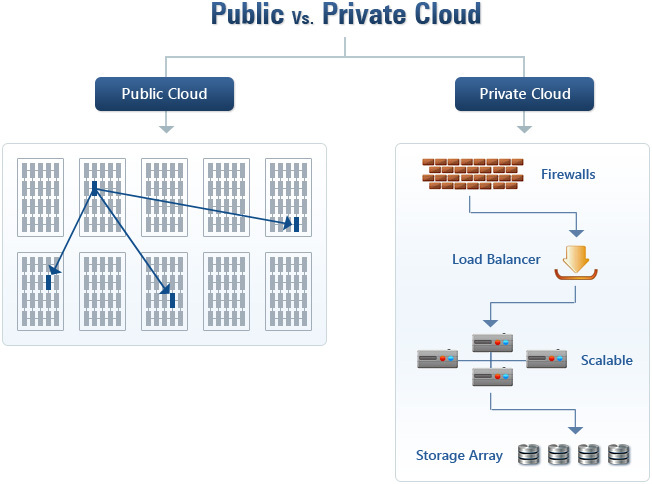 Private Vs. Public Cloud – Which one is for me? There are many points which need to be considered when moving from a standard enterprise application deployment model to cloud computing model. There are 2 major options to choose from: Public cloud and Private cloud. Often, the users are confused whether to choose public cloud or create a private cloud for their business due to privacy, security and maintenance issues. In this article, we will try to focus on benefits of each type and to derive conclusion. A public cloud is a standard cloud computing model wherein a service provider manages storage and computing resources on behalf of consumer over the Internet. The term "public cloud" arose to differentiate between the standard model and the private cloud, which runs on proprietary network or data center of the user. Public clouds are run by third parties, and applications from different users are shared on the provider’s cloud servers, storage systems, and networks. Public clouds are most often hosted away from customer premises, and they try to reduce customer risk and cost by substituting their enterprise infrastructure. Benefits of public clouds include ease of on-demand scalability as they are larger than a company’s private cloud. It also shifts infrastructure risks from the enterprise to the cloud provider as all the resources are managed by the provider only. Public cloud has raised some security concerns for businesses that have regulatory compliance requirements. It includes security against hackers and Security against resource contention. As in public cloud, resources are shared between various users over internet; they are the major target of attack for hackers. In resource contention issue, as public cloud contains shared resource which can expose all users in the cloud to security risks when any user becomes the target of a Denial of Service (DoS) attack. Applications which are required for temporary purpose or for short duration are the best suitable for deployment in a public cloud because it avoids the need to purchase additional equipment to solve a temporary need. Very popular providers of public cloud include Amazon Elastic Compute Cloud (EC2), IBM's Blue Cloud, Sun Cloud, Google AppEngine and Windows Azure Services Platform. Private cloud (also called internal cloud or corporate cloud) are typically hosted on customer premises. With proprietary computing architecture, it provides hosted services to authorized users behind a company firewall. Thus company has control over resources, data, security and QoS. The company owns the infrastructure and controls how applications are deployed on it. 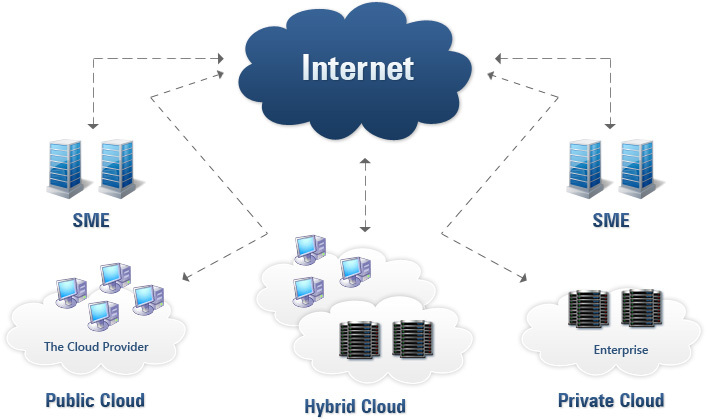 Private clouds can be deployed in an organization datacenter or also at a collocation facility. Private clouds can be built and managed by a company’s own IT department or by a cloud service provider. In this type of cloud computing, a company can install, configure, and operate the infrastructure as per its requirement and demand. Benefits of going with private cloud is increased control and monitoring of resources, flexibility of customization, ability to recover from failure, and the ability to scale up or down depending upon demand. Private cloud is less vulnerable to hackers’ attack by restricting access to its resources to authorized users and administrators only. On contrary of public cloud, private cloud provides businesses with inherent protection from DoS attacks through secured infrastructure. Private clouds are also provides path for future upgradation to public cloud. Organizations are still reluctant to go with private clouds because users still have to buy, build, and manage the infrastructure and thus do not benefit from CAPEX reduction. Due to these constraints, they cannot reap full benefits of cloud computing. A permanent application, or one that has specific requirements on quality of service or location of data, is most suitable to deploy in a private or hybrid cloud. Enterprise IT organizations use their own private cloud(s) for mission critical and other secured systems deployment.